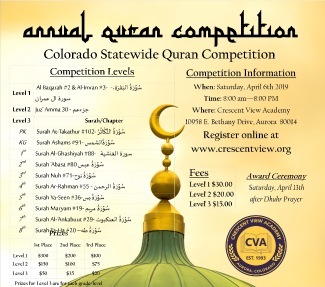 Crescent View Academy is hosting a state-wide Quran Competition this year. Inshallah, this event will continue as an annual activity for the larger Muslim Community. There are three-levels for participation. Please be sure to review the levels and signup for the correct competition. The competition will be on April 6th 2019 at Crescent View Academy. Once you sign-up you will be assigned a judging time. The Award ceremony will be the following Saturday, April 13th after Dhuhr Prayer. NOTE: This category has spots for 20 participants.